Hacksaw Ridge (2016) – WHO IS THE MAN FROM KRYPTON? War is hell. ‘Hacksaw Ridge’ tells the true story of Desmond Doss who due to certain events in his childhood, is a pacifist. Doss enlists in the army to serve with his fellow countrymen, but his objection to even carrying a gun makes him a weak link in his regiment, or so his compatriots believe. Andrew Garfield delivers the performance of his career as Desmond Doss, a pacifist who refuses to even hold a weapon. Garfield truly transforms into Doss and there isn’t a second where he drops character or loses immersion. Garfield effortlessly gets you to empathise with his character, his boyish charms, his simple yet strong willed attitude is brilliant and add to the fact that Doss was a real person just makes the performance that much better. Hugo Weaving is also great, for the little screen time he has, he delivers a powerful performance that helps establish not only his character but how war has personally affected him and moulded his current self. While the character is detestable in his actions, the fact we have the glimmers of his past also makes him very sympathetic, a lesser actor could have really played up this “evil” character but Weaving danced the line subtly and the film was all the better for having him. The entire cast are great with not a single weak actor in the bunch, even Vince Vaughn was pretty good, and that is saying a lot, he was given a fair amount of screen time in relation to most other characters and it wasn’t irksome at all, he genuinely was good. Having said that, there is a scene that is very reminiscent of ‘Full Metal Jacket’ and let’s just say, R. Lee Ermey, Vince Vaughn is not. The pacing of the story is brilliant, it flows naturally with very little lulls, it builds and resolves tension effortlessly. The only complaints with the story would be that some of it is derivative of many other war films, but even then, as this was based on a true story, with the events taken verbatim from people who witnessed them, it would be ridiculous to complain about. Mel Gibson is a fantastic director, who has never made a bad film, to be fair he’s only made a handful of films but they range from very good to excellent. ‘Hacksaw Ridge’ is different though, there is something truly special about this film, it is as though everything fell into place perfectly, the case, the story, the script, the cinematography, the directing, the score, it all assembled to create a phenomenal film that can easily stand on its own as one of the best war films ever made. 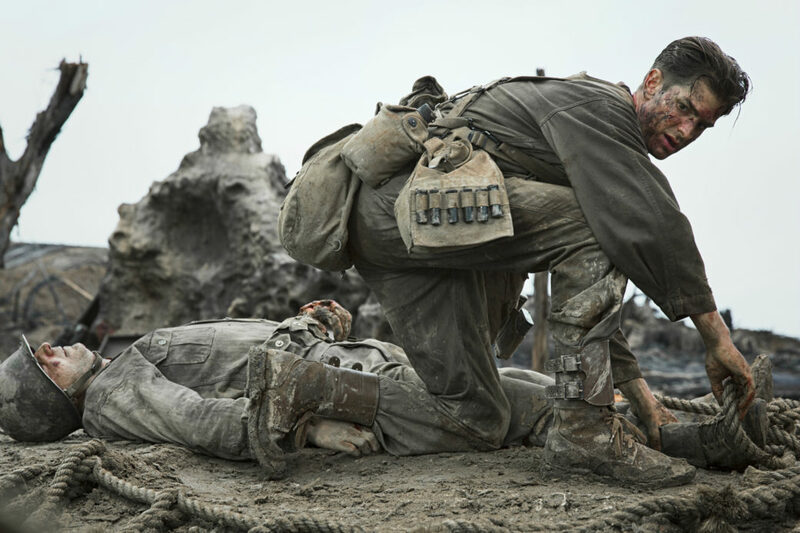 ‘Hacksaw Ridge’ takes you on a journey that is filled with tension, joy, sadness, horror and excitement, it doesn’t loosen the grip it has over you until the credits start to roll. The story is so wonderful that it deserved to be told, Mel Gibson and Andrew Garfield not only did the story justice, they accomplished a triumph in film making.